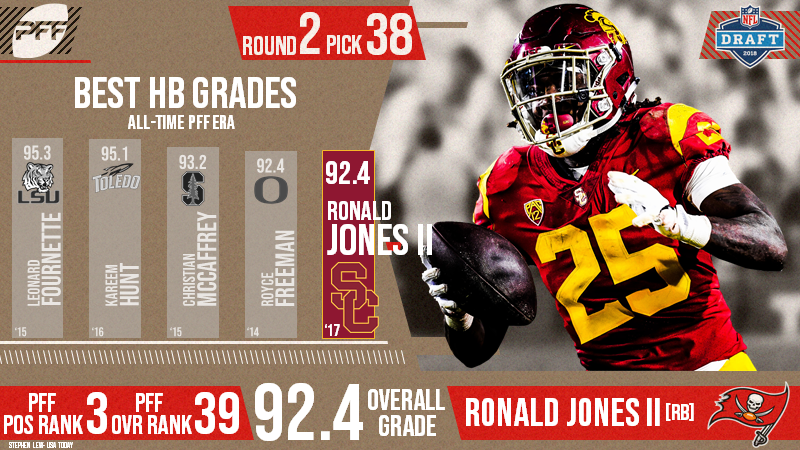 With the 38th selection of the 2018 NFL Draft, the Tampa Bay Buccaneers have selected Ronald Jones II. The former USC star was selected 38th overall after finishing the 2017 season with an 92.4 overall grade – the highest grade of any running back in the class this year by some margin (3.4 grade points. Jones II ranked 12th among draft-eligible running backs in elusive rating in 2017 (76.4). Jones rushed for 1377 yards on zone runs (inside/outside), which ranked first among draft-eligible RBs.